New laws requiring Boater safety courses will now be required for some Georgia residents. The new boater education law will promote operator safety, increase awareness of potential hazards and hopefully help save lives. Georgia Senate Bill 136 was signed into law on April 23, 2013. Part of the new Georgia Law, made mandatory a Boating Education Course effective July 1, 2014 for anyone born after January 1, 1998. This means that anyone that is under 18 years of age on January 1, 2014 will have to take an approved Boating Education Course. If you are 18 years of age or older on January 1, 2014, you would be exempt from the Boater Education Course (except when renting a vessel). The changes to the Boat Education Law were brought about after a child fatality that was attributed to a personal watercraft (PWC) operator without experience or knowledge of the PWC struck and killed a child after operating too close to the child. The new PWC and Boater Education Law Kile Glover Boat Education Law was named in the child’s honor. The intent of the new PWC and Boater Education Law is to have reasonable restrictions on people operating a vessel on a public waterway via education and child protection. 52-7-22 The department is authorized to inaugurate a comprehensive boating safety and boating shall establish a comprehensive boating education program and to may seek the cooperation of boatmen, the federal government, and other states. 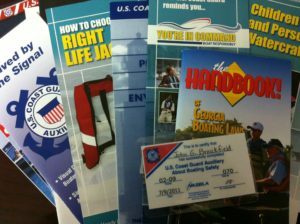 The department may accept moneys made available under federal safety programs and may issue safety boating certificates to persons who complete courses in boating safety education. January 1, 1998, who operates any motorized vessel on the waters of this state shall complete a boating education course approved by the department prior to the operation of such vessel. The new Georgia Boat Education Law is designed to educate and provide vessel operators an overview of basic boating safety laws, procedures and best practices. The education of inexperienced vessel operators hopefully will help protect the general public when on Georgia’s waters. If you are interested in signing up for a course in your area, you may visit the United States Coast Guard Auxiliary website Zip Code Locator to find a course in your area. New Georgia Law mandates a Boating Education Course effective July 1, 2014 for anyone born after January 1, 1998.